After a great Christmas we are the road again. 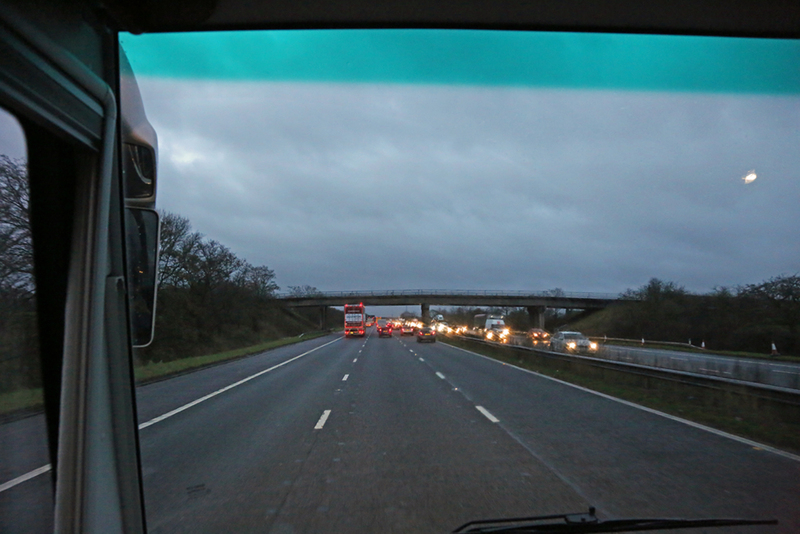 Storm Imogen chased us down the M6 and over the channel. 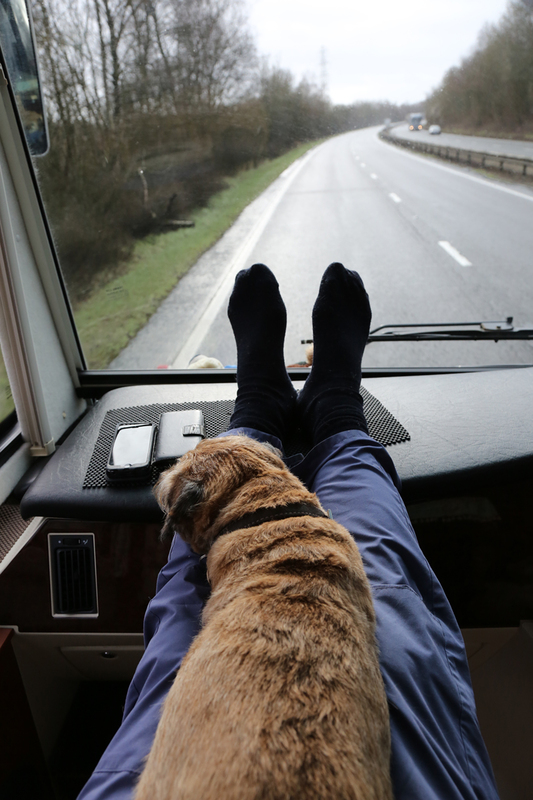 Penny’s favourite seat….best used when I’m not driving. 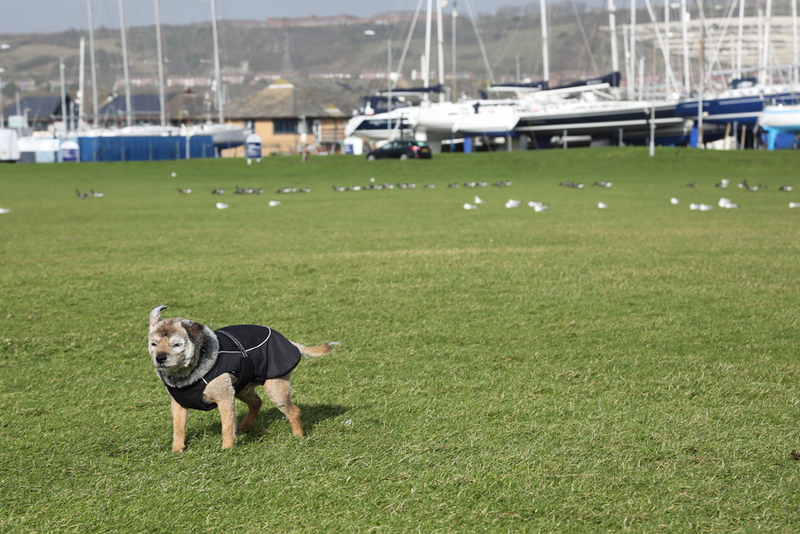 We stopped at Port Solent en route…masses of free motorhome parking…to give the Krays a run before embarking. It was seriously windy; the seagulls were flying backwards. 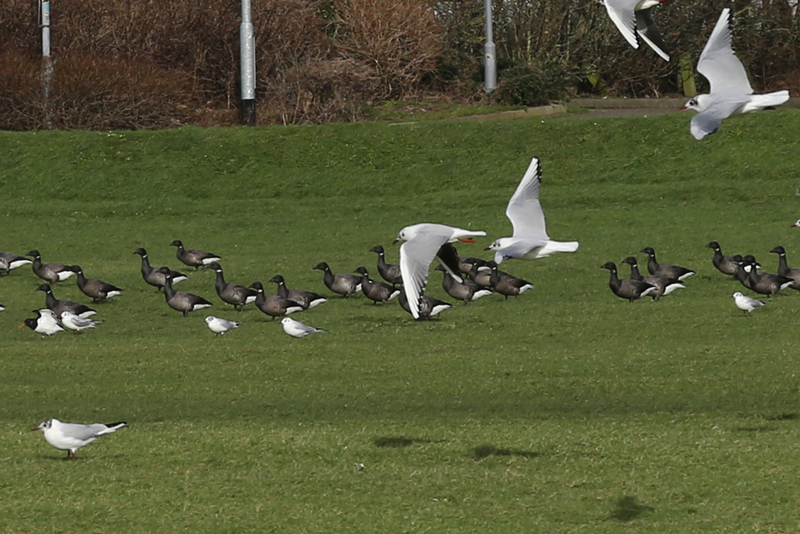 A large flock of Canada geese were more sensible and had chosen to walk not fly. 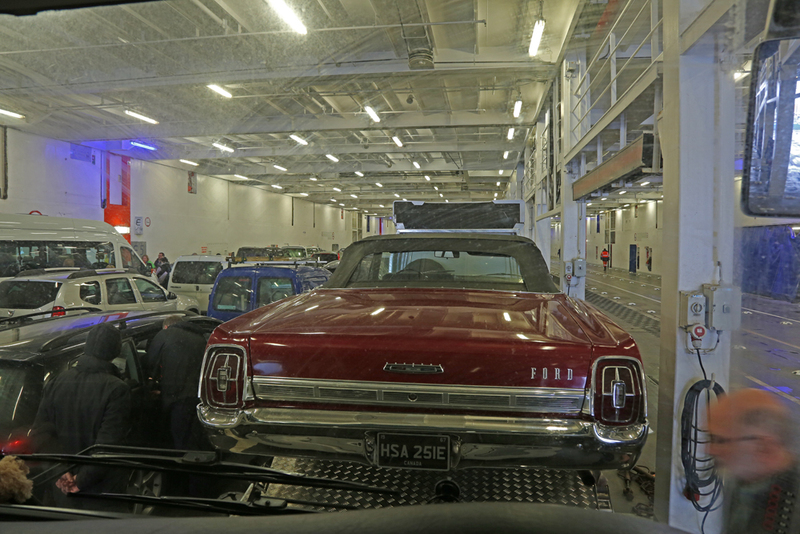 We boarded the ferry at about 2.30 pm for the six hour crossing and followed this smart old Ford up the ramp. 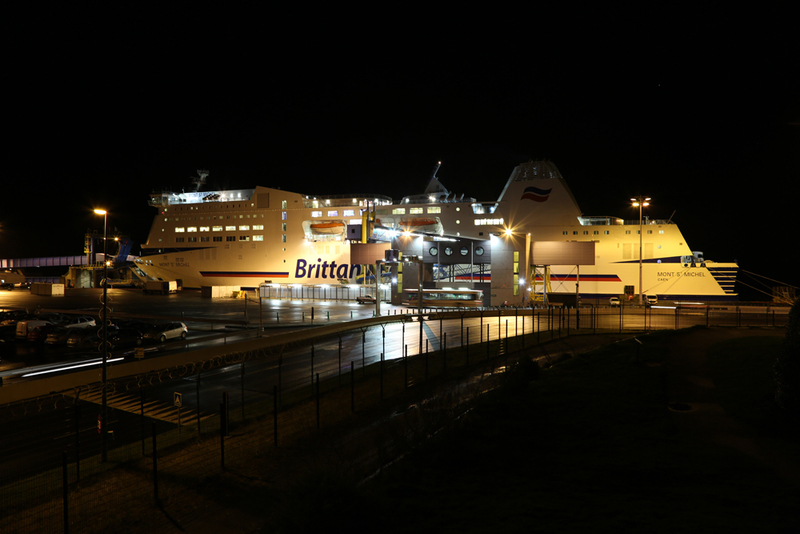 We went over on the Brittany Ferries Portsmouth-Caen route. The ferry was bang on schedule despite the weather. We like this line. Being French the food is always good. 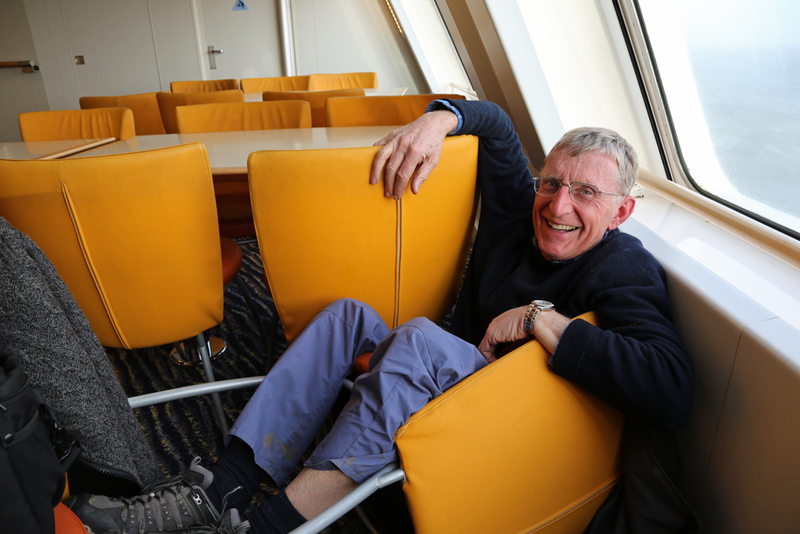 We sat in the forward cafeteria, scoffing a guinea fowl casserole avec frites, and watched the waves crashing over the bow. 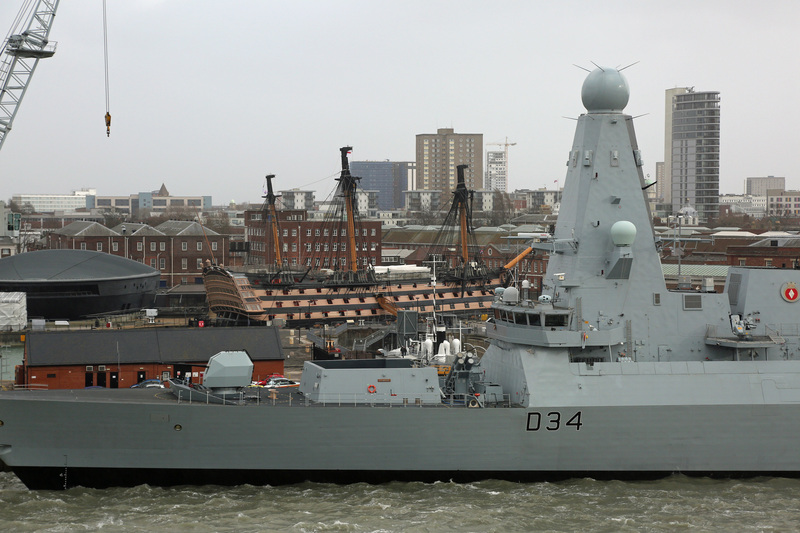 The ferry leaves port past the Historic Dockyard. HMS Victory, Nelson’s flagship, is just behind a more modern warship and to it’s left is the building housing the Mary Rose. This was Henry VIII’s flagship, rescued from the Solent mud where she had lain since sinking in 1545. 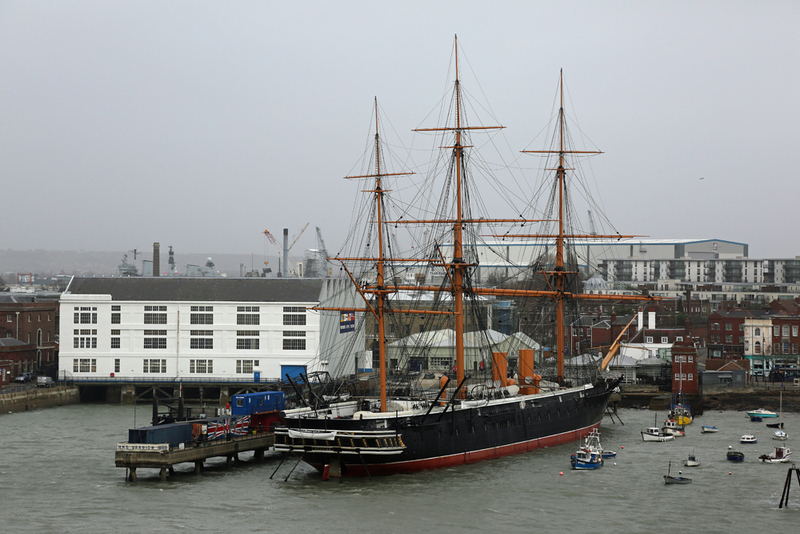 HMS Warrior was the first British steam powered warship…they kept the masts in case of engine failure. She never saw action. 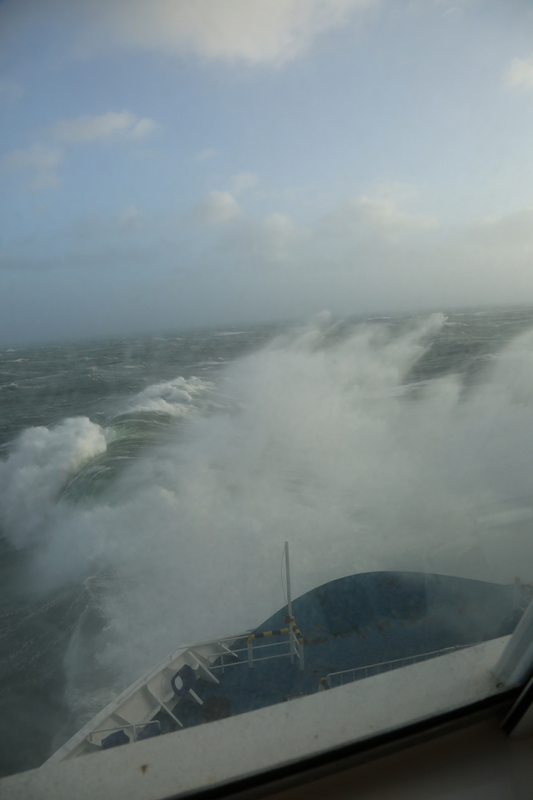 The decks were closed due to the inclement sea conditions and we spent a while wave watching over lunch. Every so often a particularly large wave rolled the boat and a tremendous crash came from the kitchens; they need to invest in some gimbals. One mega large wave tipped me back out of my chair (no…I hadn’t been drinking…thanks for asking). Rather than helping me up, Mrs Miggins insisted that I hung on while she composed my photograph…never mind that I looked like a prize idiot. Luckily the cafeteria was almost empty. We parked at Ouistreham aire for the night. There is a good walk on Sword beach for the Krays here. Rambling about Europe with the Kray Twins (Colin and Penny). 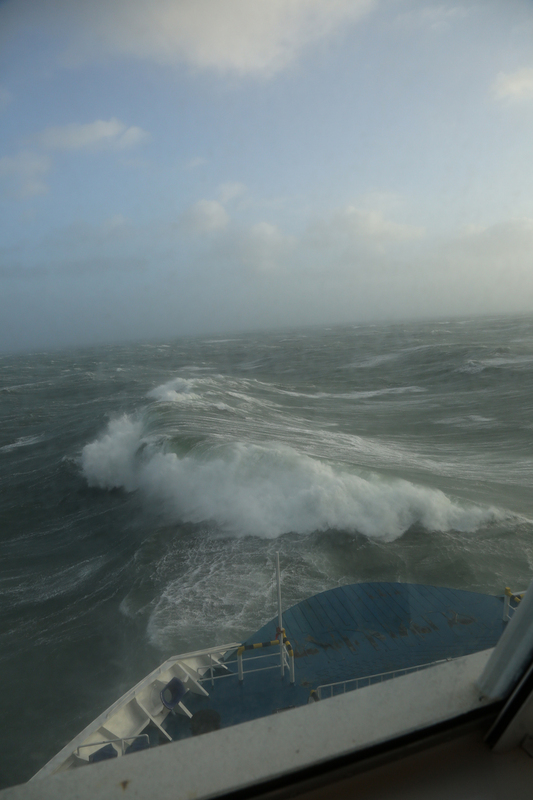 Bonjour, P&N’, glad you are safely over the Channel. Looked like a thrilling cruise. Have a great time down yonder. We may venture a le Arthur, as we don’t go to Scotland till mid June. Nice to hear you reached the Continent safely! I’ll be following your adventures with great interest! Happy travels! After Sunday I thought we were making progress, you are now literally rubbing salt in the wounds, Mrs T would not have got on that ferry. Have a great time. Oh Dear!! 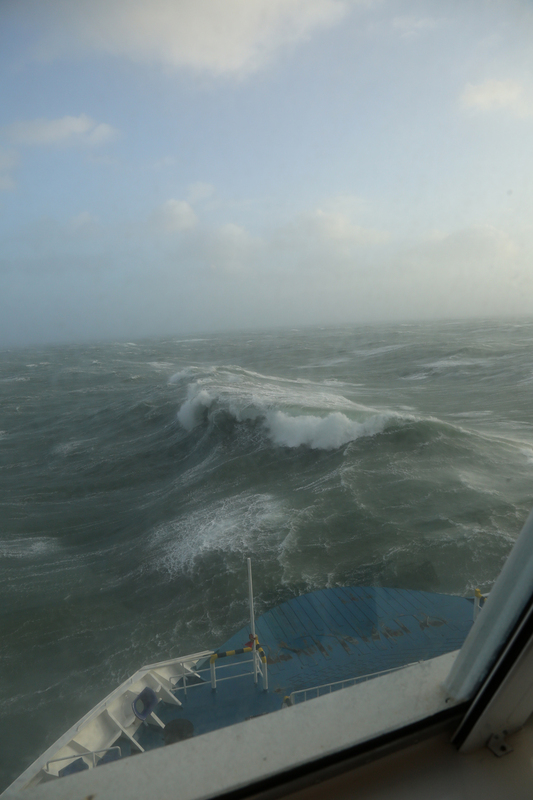 Actually we lied…it was flat calm…just photo-shopped the waves. 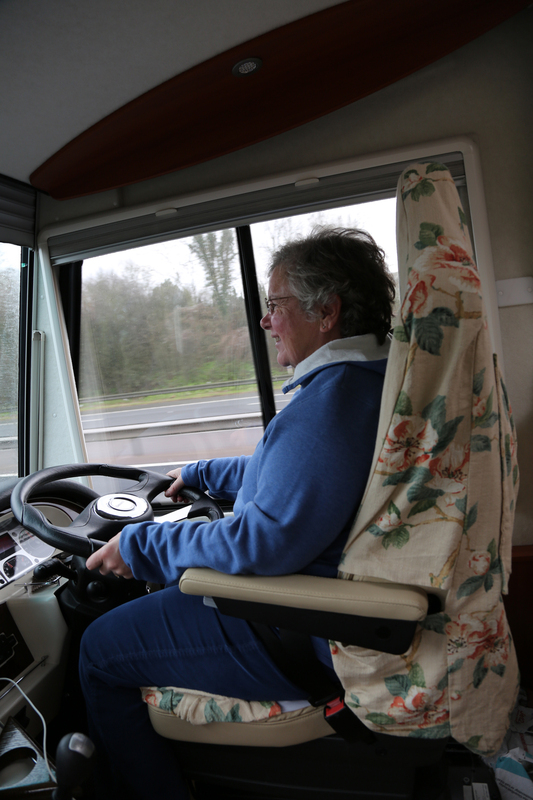 Also..I believe the channel tunnel is generally very smooth…ask Mal and Sheila. Amazing that they could serve, and you could eat in those conditions! Hi Guys, where are you heading? Hi Steve…we are currently at Hendaye Plage in SW France. We were thinking Portugal but bad forecast for next few days so will head for Valencia tomorrow. Missus says she will divorce me if I don’t find some sun soon. We will decide on tomorrow night’s site while in transit ..Current plan is to then move SW along med. coast and visit Portugal in a few weeks, when weather is better.